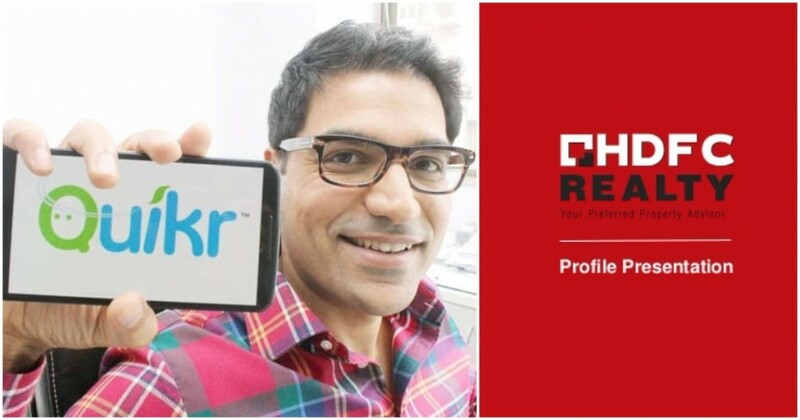 Quikr has been one of the most prolific acquirers in the Indian startup space, but now the unicorn appears to have set its sights beyond just startups. Quikr has just acquired HDFC Developers and HDFC Realty for Rs. 357 crore, filings to stock exchanges showed. HDFC will get an undisclosed stake in Quikr following the deal, though reports estimated it to be around 3 percent. HDFC Realty is HDFC’s property broker that helps people find and buy property offline, and HDFC Developers runs HDFC Red, a portal that helps people buy property online. Both the acquired entities appear to have been small projects within the HDFC ecosystem. HDFC Developers had revenues of Rs 6.23 crore in 2016-17, while HDFC Realty had revenues of Rs 35.25 crore. Neither was significantly contributing to HDFC’s overall turnover — the two combined represented only 0.07% of HDFC’s overall revenues. HDFC Realty’s offline brokerage business had presence across residential and commercial properties, and also provided consulting and valuation services. It had a 300 member in-house team and has a network of 7,000 brokers nationwide. HDFC Red, the online real estate portal has 7,000 project listings, and reportedly receives 80,000 unique visitors a month, which isn’t particularly significant when compared to other real estate portals in the country. The deal, though, is expected to buttress Quikr’s already-significant real estate portfolio. The company already has a foothold in the space through its QuikrHomes product, which lets people find homes online. It has also made several acquisitions in the space. Quikr had acquired real estate portal CommonFloor last year, which listed homes for sale and rent. It had then gone on to acquire GrabHouse, another startup that listed homes for rent. In 2015, it had acquired Indian Realty Exchange, a mobile app that enabled real estate agents to map agents with projects and locations, and in the same year, had also acquired real estate portal Realty Compass. Quikr already offers everything from a product marketplace, to a jobs portal, to even home spa solutions, but it’s clearly is betting big on the real estate space. With four startup acquisitions, two acquisitions from a listed entity, and its own QuikrHomes products, Quikr has become the de-facto leader in solutions in the properties market. Though it remains to be seen how these acquisitions will all work together — integrating seven disparate entities into a unified real estate portfolio might not be easy.